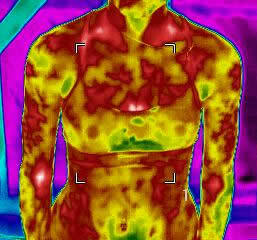 Thermal imaging is useful in determining hot and cold areas which can be a sign of inflammation or an injury. Using a thermal camera allows us to see if the pain is referred pain or if the inflammation is strictly over the painful stimulus. Our thermal camera also allows us to determine specific temperatures as well as the mean temperature of a specified area. This option has been utilized to look at how different fabrics affect superficial skin temperature while exercising in the heat.